I’ve noted where a hymn tends towards particular occasions/seasons, and which tune I had in mind. Only one of my hymns (Hope for the world’s despair) is currently registered with CCLI – for this one you’ll need to do what you’d normally do with CCLI-administered hymns. If you’d like to use any of the others, please do help yourself, and just include a note that it’s copyright (c) Ally Barrett. Written for Helen and her churches. Tune is Slane. Explores Lenten themes and images. To lead us and guide us and show us your way. To help us be faithful in following you. To nestle beneath the soft wings of your grace. Our hearts will find peace when we’re resting in you. can we be truly whole. The blessings of your love. draw earth to heav’n again. were bound to set us free. may know your saving grace. I was asked to write a wedding hymn to the tune of ‘On Ilkley Moor’ and due to my complete inability to work out how to get a normal 8686 metre to fit to the tune, I wrote this instead. I now do understand how to get existing 8686 words to fit, but thought I might as well keep the words. Foretaste of heaven, love divine! For love endures for ever. Two lives entwined, lived side by side. To honour, love and cherish. Living the wondrous words we say. The following words were written to the tune ‘Ewing’ (Jerusalem the golden), at the request of St Martin in the Fields, for a BBC Radio 4 Sunday Worship broadcast in February 2018. It would also go to pretty much any 77676D iambic tune, of which there are many. Who rose to claim the hour. By speaking the truth to power. To make all voices heard. A place where all belong. My train was delayed so while I waited I wrote this, to the tune of ‘I saw three ships’. It’s not profound, but it might be useful to someone somewhere. on this and every morning. I owe a huge debt of gratitude to St Catharine’s College, Cambridge for their vision and commitment to empowering young women through music (specifically, by means of their girls’ choir) which has enabled my daughter to have a first rate musical education and experience some things that I never had the chance to do at her age (or indeed ever!). Here’s what I wrote for the College’s Commemoration of Benefactors service in 2017. At the Director of Music’s request, the tune is chorale Schmucke Dich, usually sung to the words, Deck thyself, my soul, with gladness). Still our hope in God is founded. Through the sacred gift of learning. To the truths that are worth knowing. all to find our heart’s true treasure. We may know a perfect ending. This was written for a friend, who wanted a new carol to sing as part of a nativity play. It goes to the tune of the Dance of the Sugar Plum Fairy (from Tschaikovsky’s Nutcracker Suite). Here’s a tune that I’m pretty sure I wrote that’s in the same metre as Guiting Power 8.5.8.6 (plus a refrain with scope for between 15 and 17 syllables). Think of it as a less good-looking stunt double for Guiting Power, but sort of the same vibe. I called it Wulfstan Way because that’s the name of the road that my current church is on. This was written for Ely Cathedral’s Science Festival (May/June 2017). The tune is Love Unknown. our words and numbers fail. to life in myriad ways. A children’s song for Palm Sunday. To the tune ‘she’ll be coming round the mountain’. Riding on a donkey when he comes. Sing hosanna when he comes. This was written for Birmingham Diocese, for the launch of their mission strategy document. hold us all in one embrace. difference as a gift of grace. lift our voice to sing your praise. fit to tend a troubled earth. living out the gospel hope. call us now to work with you. joyful in the world today. I wrote this for someone who was planning a service to pray for all those who work as safeguarding officers. One sets out to write a hymn about this subject with a certain degree of fear and trembling. But here it is. As always, it’s free for anyone to use – you don’t have to ask. Feedback is always welcome, too, and I’m grateful to the editors of ‘Singing the faith’ for their helpful suggestions that led to this final version. The tune is Corvedale (that’s the triple time tune that’s often used for There’s a Wideness in God’s Mercy). as we live and move and grow. held in one divine embrace. from the voices of lament. that is every person’s right. to this ministry of care. we will love and serve our Lord. In the wake of 50 gay people murdered in a night club in Orlando, an MP murdered in her own constituency, and UKIP publishing what many feel to be an advert inciting racial hatred, I couldn’t sleep. Too many fears and tears for such a broken world. So I wrote this as a prayer, to the tune Kings Lynn (aka O God of earth and altar) – though any suitable sombre 7676D tune would work. It’s been sung to Corvedale, and it’s also had two tunes specially written for it: Finsbury Park and another one for which I have lost the link(!) which is in a more contemporary style. As with all my hymns, please do just help yourself: share, sing, print, whatever’s helpful. This was a first reaction to the murder of 49 people in a gay nightclub in Orlando. The tune is O waly waly. that love at last will win the day. to see that this is how love wins? reviving, renewing, and making us whole. transforming God’s people into all we can be. to feed on the grace which God alone can impart. in thought, word and action, our life is our prayer. This one goes to the tune Bunessan (Morning has broken). It’s based on the theology behind the gospel story about tax: ‘render to Caesar that which is Caesar’s; render to God that which belongs to God’. Basically, the coin had an image of the Emperor on it, but the image of God is found in humanity, so our true tribute to God is ourselves. A little something for the Queen’s birthday. The tune is Praise my soul, the king of heaven. This was a collaborative effort between me, Julie Bacon, Gill Robertson, Leah Vasey-Saunders, Sheridan James and Cate Williams. Through the times of joy and fear. Give us strength to persevere. Pray to choose the good and right. In God’s way our shared delight. in the tasks each day may bring. As we seek to serve the King. sharing faith in deed and word. Fellow servants of One Lord. The first ever Godparent Sunday in the Church of England was on 1st May 2016 – The Powers That Be felt that it deserved a hymn all of its own, so they asked me, and I wrote this one. This hymn started as a sermon, then spent some time as a sonnet, before being repurposed as a late Advent hymn. It would go to Woodlands or similar. yet in their gaze the earth met heav’n above. and raise our voice to join the great Amen. This was written for Rita, whose church is dedicated to the Transfiguration, as there aren’t many hymns written for that particular feast day and they wanted to sing something new! The tune they asked for was Ellacombe (‘The day of resurrection’), as they enjoy singing it at Easter and wanted to use the tune again for their patronal festival. all joyful songs of praise! And on him fix your gaze. to set the soul ablaze. is blessed with God’s delight. could out of death be grown. in all that God has planned. in this and every land. Here’s a hymn for Easter day, written for the very lovely Cate Williams. It’s based on the John 20 gospel reading about Jesus and Mary in the garden. The tune is Praise my soul / Lauda anima. As always, help yourself if you like it. If you want one that’s more for the Easter season, then try this. This hymn is about work, so is one of those hymns that will be useless on almost every occasion except for the tiny few occasions when it’s useful. The original tune I thought of was Guiting Power (Christ Triumphant, ever reigning) but the composer of that tune doesn’t like it used for anything else, so I wrote this one, which I’ve called Wulfstan_Way (which is the name of the road that our current church is on!). bound us, set us free. now and evermore, we pray. Here’s a draft of something for Ash Wednesday. The tune is ‘Let all mortal flesh’. Comments for improvement are very welcome, as always. This was written for the service in York Minster on 17th May 2014, to celebrate the 20th anniversary of women priests in the Church of England – anyone is welcome to use it, though. The tune is Londonderry Air. of all the sons and daughters of the earth. the warp and weft that patterns time and space. and we can touch eternity in your embrace. as guests and hosts at your thanksgiving feast. We sing with joy, your greatness we proclaim. Our souls with Mary magnify your holy name. to lift the ways of earth to heav’n above. so we may speak and live your Word afresh today. This one was written for Yvonne Brae’s church, who wanted a bouncy song for Epiphany – it’s a very simple one, to the tune ‘Sing hosanna’. As always, if you like it, you’re welcome to use it. to warm seven billion human hearts. dispersed through this and every place. Bless’d Son, illuminate our day! to lead us through the hours of dark. and make us bright and brave and whole. in awe at what our faith reveals. Your universe unites in praise. Amen. At various times there have been challenges issued on facebook and twitter, seeking alternatives to All Things Bright and Beautiful, Lord of the Dance, and Jerusalem, at weddings. Here are some fruits of those challenges. The most observant of you will spot that I’ve used the second verse tune for both verses (the difference is in the rhythm of the penultimate line). I’d like to thank those who commented on the first draft of this and helped me improve it. Made through this covenant of grace. and walk in step along life’s way. Teach us new songs of joy divine! we’ll walk together all life’s way. A Hymn for Candlemas (aka the Feast of the Presentation of Christ in the Temple) Tune: Repton. In this great house of prayer. and brings your children home. to make the earth anew. in heaven’s peace at last. and make earth’s darkness bright. a place in heaven above. your love will hold us fast. This one is very loosely based on the story of Jesus healing the woman bent double (Luke 13.110-17). Finds an echo here below. Quench our thirst, our souls repair. God’s own loss has bought our gain. All are welcomed, none left out. Brings an end to fear and doubt. Here accept your gracious call. Show the Way of Life to all. Christ’s new body let us be. keep faith that you will hear us. in grace and wisdom growing. Lord, by your Spirit, guide us. This one used to have five verses, but it got rather dramatically rewritten during the conference at which it was to be sung – and not just by me, there was a whole group of us tussling with it by the end! It was all a bit traumatic actually, but helped me work out a few things, thanks to the wonderful keynote speaker on the conference, Stephen Cottrell, now Bishop of Chelmsford. and keep eternity within our hearts. in lives illumined by your glorious light. we’ll sing this story of transforming grace. for this, your needy earth. To yield a richer fruit. the trophies you most prize. diverse and yet as one? and room for all who come? In this and every place. Tune: this will happily go to St Denio (Immortal invisible) or Away in a Manger. To give you the glory, and sing forth your praise. To fall down like rain on your people below. For us you are also the Father we love. The Lamb who was slain, who now sits on heavn’s throne. In mercy, receive all the prayers that we bring. The Father, the Son and the Spirit be given. Our Lord God and Father, our heavenly King. This next song was intended to make a link between the ‘Jesse Tree’ / Salvation History pathway through advent, and the Advent Sunday theme of keeping alert and being ready. Tune: I wrote this with Tallis’ canon in mind, but the very wonderful @artsyhonker has written it a great new tune, which you can read and play on her blog. I found this versified ‘Prayer of Humble Access’ on my computer, half finished, with no recollection of having started to write it. Now I’ve finished it, I can’t actually imagine a situation in which it would be preferable to sing this than to say the standard version of the prayer, but there you go. I guess it would go to any 8686 iambic tune (ie anything that sounds like How sweet the name of Jesus sounds). Great words, where’s the music I was sure you would have written, having been such a great composer at school?!? That’s very sweet of you. I don’t write a lot of music these days, and with hymns it’s amazingly difficult to get a congregation to try new music – they don’t mind singing new words to a tune they know, but they get scared of a tune they don’t know! So I sort of gave up writing tunes, and just wrote new words instead… Glad you liked the words, though. How are you doing these days? I see bits and bobs on facebook. I found your site almost by accident – a very happy accident! I love your hymn for All Souls, which I found while looking for a suitable alternative to ‘The Lord’s my shepherd’ and ‘Abide with me.’ Do you have anything for a single funeral? I fully endorse your comment on people being scared of new tunes, by the way. In one parish I taught them and the organist was wonderful at working them into his voluntary. In another I got threats of resignation! I just remembered! I did actually write a funeral hymn, specifically for a baby funeral, but I was never confident enough about whether it was ‘right’ to publish it… perhaps I should revisit that one and see if it is redeemable. 1) If you have one, see if you can get the choir to sing the new tune (possibly to old words!) 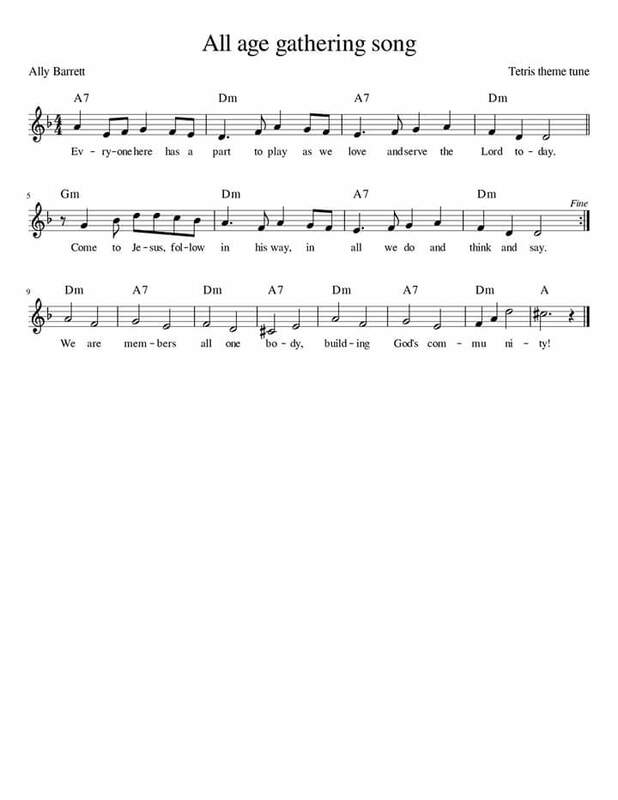 as a Communion hymn a few times. 2) In the weeks running up to the use of the new tune, ask the organist to play it as part of the processional or recessional voluntary (whichever people are more likely to listen to), or even a short verse after the reading of the Gospel if appropriate. 4) Try to get people to sit close together. If you are Anglican this is probably the hardest step. You’re right about the sitting together! We have a choir once a month at our all age service, and we do try the other things too. The frustrating thing is that when we do introduce a new hymn (and we try to make sure that they’re always good ones) and use it a few times, it then becomes a familiar hymn and everyone likes it. It’s just that first bit that feels scary for the congregation. But we are moving in the right direction…. Thank you for your hymns. I found them while looking for new material for a lay-led Rogation service ( I like The Shepherd). Because you are a musician (as I gather from comments) your words and rhythms do really fit the tunes you suggest: such a relief, when this is NOT always the case with new hymns! Thank you – I really appreciate your feedback and you’re welcome to use any of them any time you like. Leading workshops at day with RSCM and Musicademy on Saturday – expect quite a mix of participants so hoping Hope of our calling will appeal across the board. Thank you! I love Hope of our Calling, I have chosen it for both of my licensing services. Thank you! I have been introduced to ‘Hope of our calling’ by our ordinand who is studying with ERMC and we will sing it this Sunday (Vocations Sunday). I will also offer your new words to ‘All things B&B’ to our wedding couples and baptism families in fervent hope and prayer! P.S. How about a new Advent wreath song? We’re fed up with ‘The holy and the ivy are dancing in a ring’ but haven’t found anything else yet. Which themes do you use? I wrote one that alludes to the patriarchs/prophets/Jesse tree thread and links it to the being ready thrust of the Advent 1 readings, but if you wanted something more specifically geared to the wreath, eg something with a verse for each week and a repeating refrain, I can have a go – let me know what you’d like. Wonderful! So glad the hymn hit the spot, and every blessing on your ministry. Thanks so much! We used (and will use again) the refreshing and relevant words of the hymn for Mothering Sunday here in Bombay Cathedral (India). God bless you and your family in your ministry. I’m so glad these words have been useful to you, and I hope your congregation enjoy singing them. Bless you! I am planning to use “A Song of Moses and Miriam.” How would you like for me to credit your work in our service bulletin? I’m very happy to hear that this hymn is having another outing – I’m never sure how many churches actually sing the canticles at the Easter Vigil these days. I hope your congregation enjoy it. How about something like this? You are very welcome – delighted the hymn will be useful, and enjoy your liturgical play while you have the chance! Did you also find ‘Glory to God, the mother of creation’? It was written for the 20th anniversary of women’s ordination to the priesthood. It’s on this page somewhere, but if you can’t find it, let me know and I’ll send it some other way! It may not quite hit the spot, so no pressure either way! Thanks for your creativity & generosity Ally – we’ll use the 2 hymns for Mothering Sunday in our (Australia’s) 2 Mother’s Day Services this Sunday 8th May ’16. Thanks for your creativity & generosity Ally – we’ll use your 2 Mothering Sunday hymns this Sun 8th May ’16 – in our (Australia’s) 2 x Mother’s Day Services at St John’s – with appropriate acknowledgement & thanks. You are so very welcome! I love hearing about how far round the world my hymns have been travelling – every blessing on you and your ministry. Well, that was a surprise this morning to hear you on the Radio 4 service! And thanks for yet another very moving hymn! Reminded me of the session you did for us at Offord Fellowship singing through several of your compositions!! I hope you are all well, and enjoying life in Cambridge! Pass on my best wishes to Sam and the children – I guess Joanna and Daniel are shooting up now! I seem to think that Joanna has another birthday coming up this next week – hope she has a good day! I’m retired now, and living in North Essex in the village of Great Sampford, but am keeping busy! Have joined the Sampford Singers (affiliated to the RSCM! ), and helping out our local Anglican Churches now and then at the organ!! (Playing yesterday for a wedding at Radwinter Parish Church, and this evening for evensong at Great Sampford Parish Church!) I’m also looking after the Baptist Church at Thaxted (3 miles away) while they are in the process of looking for a new minister! Greetings from Cape Town – to tell you that we love your new hymns and have used a couple so far at St Thomas, Rondebosch, thanks to your friend Lorna Lavallo-Smith, who told me about them. I am the organist. You have inspired me to look at doing my own writing, thank you! Wonderful! Thanks so much for getting in touch, and I’m so glad you like my hymns and have been inspired to write your own – I’d love to see the fruits of your creativity. Every blessing on you and your ministry. I don’t think I know that Townend song – but very happy for you to re-jig my words so they fit! You’re welcome to use any of my songs, any time – it’s lovely to know that they’re out there being useful. I didnât send this email. oops, sorry, I typed Dave instead of David! So glad you have found useful things here – help yourself any time. Thank you! It’s lovely to hear that people enjoyed singing it as much as I enjoyed writing it. These are just lovely ( full of love and purpose) Thank you so much for sharing them so generously. I would love to use some of them. Thank you! Please do use any of them (or indeed anything else on this site) – I hope it’s a blessing to you. I’m also using “Here and now we’re drawn together” and attributing to you on our overhead. I love the extra verse!